Urog is an Orc ranger living in Narzulbur, the Orc stronghold of Eastmarch. She is the daughter of the tribe's chieftain, Mauhulakh, and sister to Dushnamub. 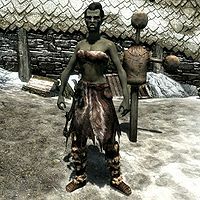 She can be found using a training dummy to practice her axe skills from 7am to 7pm, right in front of the stronghold's longhouse. After that, she heads inside to eat until midnight. Urog is content to spend her days training to be a stronger hunter with the help of her great-aunts, Yatul and Bolar. She dismisses Dushnamub's attempts to persuade her otherwise. "My brother keeps trying to spin these fantasies on me about our aunts and our father. He's crazy." She has started to resent her father as well. His sitting around all day, depressed over his dead wives, isn't something a normal Orc chief does. "Sometimes I wonder if my aunts are right about my father -- he does seem weak." This page was last modified on 30 September 2016, at 01:41.